LOS ANGELES - Gertrude Baines, a former maid who was born before the discovery of penicillin and was the world’s oldest person, died yesterday in Los Angeles. She was 115. She died peacefully in her sleep at Western Convalescent Hospital, according to the hospital’s administrator, Emma Camanag. An autopsy is planned. The Shellman, Ga., native, whose father was believed to have been a slave, was born April 6, 1894, when the US flag had 44 stars and Grover Cleveland was president. She married at a young age and later divorced. Her only child, a daughter, died of typhoid at 18. Ms. Baines had outlived all of her relatives. Her image - cinnamon lips turned up in a gentle smile and thinning hair tucked under a bright red bonnet - was broadcast nationally in November when Ms. Baines, then the oldest person of African descent and the third-oldest person worldwide, cast her vote for Barack Obama as president. Acclaim escalated two months later, on Jan. 2, when 115-year-old Maria de Jesus of Portugal died and Ms. Baines was handed the title of oldest living person by the Gerontology Research Group, which verifies claims of extreme old age. Reporters, photographers, and camera crews descended on the quiet Los Angeles hospital that had been the supercentenarian’s home since she broke her hip at 107. She made headlines across the globe. Fellow senior citizens at the hospital, some approaching 100, said they desired her longevity. All the while, Ms. Baines slept away in her robe, now and then breaking from her routine of eating crispy bacon, watching Jerry Springer on TV, and participating in church services to take interviews. The attention, the questions, the fascination people had with her age in her final year amused and perplexed her. The question Ms. Baines seemed to like the least was the one she got the most. What’s your secret? How do stay alive so long? Aside from arthritis, Ms. Baines had been in good overall health until recently. Growing up in Georgia while Jim Crow laws were in effect, Ms. Baines lived through a time when blacks were blocked from voting and subject to violent racism. She lived in Ohio and worked as a maid at Ohio State University. She then moved to California, where she settled in Los Angeles. 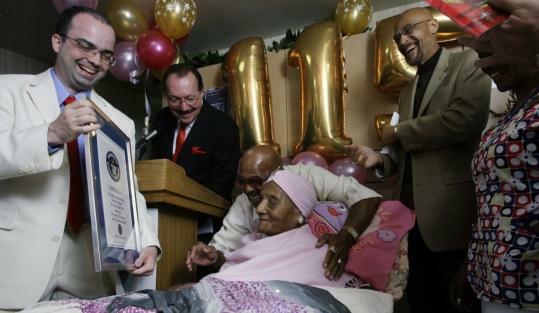 She lived alone with the help of a caretaker until she turned 107. Her walls at the hospital were a shrine of birthday cards, honorary certificates, and letters from the mayor, the governor, and several presidents. Although church volunteers, relatives, and fellow senior citizens kept her company, Ms. Baines rarely opened up to anyone other than her favorite caretaker, Cynthia Thompson. On Thompson’s days off, Ms. Baines often refused to get out of bed. The two shared a strong bond. Thompson helped Ms. Baines to change her robe, allowed her to wash her own face, and respected her privacy. In return, Ms. Baines laughed at Thompson’s jokes and opened up about long-gone days when she would ride to church in a horse and buggy. She told Thompson she was not afraid to die. Only of being alone. As she rang in her final birthday on April 6, Ms. Baines was anything but that. More than 100 people crowded around her at the hospital to celebrate her birthday. Giant balloons, flowers, certificates, and good wishes from Obama and Governor Arnold Schwarzenegger of California poured in. Topped in pink with pearl earrings, Ms. Baines took it all in and nodded her head in approval. With her passing, Kama Chinen, a 114-year-old Japanese woman born May 10, 1895, is the oldest person in the world.